There has been a very small change to the draws and schedule ahead of Saturday. One withdrawal in the Over 60's and no reserve Over 60's player and a couple of matches moved around in other grades. Please double check your match time is the same. Please try to arrive at the club at least 20 minutes before your first match. This will be a tough day to organise so please arrive promptly and referee the next match straight after you finish, this will really help the day to go smoothly. All the other draws have remained the same as below. The schedule is the top file, click to open and see when you will play. This is going to be a busy tournament as the event is fully subscribed. I have managed to get some of the reserve list in to replace withdrawals but there are still players waiting so if you do need to withdraw please do this as soon as possible. The event on the day is being run by Chichester Head Coach Mike Phillips. Mike is a top Racketball player and great tournament organiser but there is a lot of Racketball at Chichester so please help him as much as possible by being on time for your matches and marking straight after you finish. Small groups - best of 5 games! Please not that next to some of the groups you will see “best of 5” written. This is when a group only has 3 competitors and so that everyone has plenty of Racketball on the day. Groups of 4 players or more will always be best of 3 games! If you finish 2nd in your group in the Over 50’s you still have a chance to make it through. This works on number of games won so whoever gets the most points but fails to progress through the group stages will be lucky loser 1 second most points will be lucky loser 2. If points for are a draw then it goes on points against. If both are a draw the lucky loser position will be decided by a best of 1 game to 11 shootout! There is a reserve list so if you are on the entry list but need to withdraw please let me know as soon as possible so that I can add reserves to the list. Chichester Racquets and Fitness Club is hosting the seventh event in the 2017 HEAD UK-Racketball Series on 28th October. 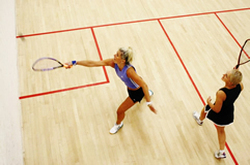 Chichester have hosted a UK-Racketball Series Event for the past five years and we’re still going strong! Chichester Racquets and Fitness Club has a strong racketball tradition under Head Coach Mike Phillips. 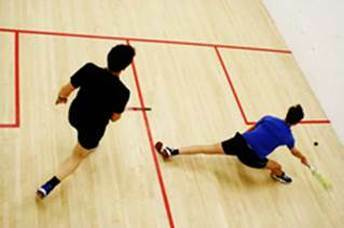 The club has its own racketball section; with internal leagues and Club Championships continuing throughout the year. With only 60 places available and anticipated high demand, do not delay in securing your entry as soon as possible! To have a look at previous winners of the Chichester Racketball Open follow this link to our Hall of Fame page. If you scroll down you will be able to find the location pages at the bottom with the Chichester page at the top of this list! The Chichester club boasts five courts including a championship glass back and arguably the best facilities out of any club in the Series. The club has a modern and spacious dining and catering area and food is served throughout the day. The heath suite consisting of a spa pool, sauna and steam room has made the venue one of the most popular on the Series and is perfect for post-match relaxation. The health suite is available to all competitors throughout the tournament and there is a comfortable lounge area to relax in. The bar is situated close to but just tucked away from the courts making it the perfect place to chill out away from the racketball. The club patio area is rated as the best sun trap in the city and if we’re lucky enough with the October weather, refreshments can be enjoyed in the sun! Chichester is one of the prettiest cities in the UK and the Club itself is set only a stone’s throw away from the charming city centre with idyllic views over Oaklands Park and the Chichester Festival Theatre. Click on the links below to see the full results from Chichester 2016.